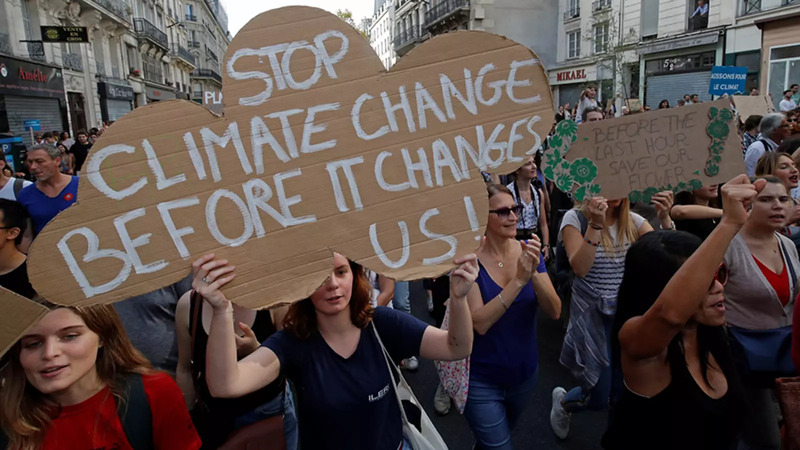 The Intergovernmental Panel on Climate Change recently released a report that expressed concerns about the serious and immediate consequences of a warming planet. Speakers will discuss on how countries are adapting, or preparing to adapt, to the impending impact of climate change. I’m Jason Bordoff. I’m a professor of professional practice at Columbia University School of International and Public Affairs and I direct the Center on Global Energy Policy at Columbia University. I’m really delighted to be here with such a great group of panelists and also such a spectacular group of meeting participants both in New York and D.C. I looked at the list and many familiar names with deep expertise on this topic. So I look forward to expanding the discussion and bringing questions from all of you in after we’ve had a chance to pose—I’ve had a chance to pose a few questions to the participants here. I want to thank CFR for organizing this discussion. We often discuss the problem of climate change and especially the challenge of mitigation and how much work needs to be done to deal with that. Maybe not often enough talk about the title of this event, and I especially appreciate the way CFR titled this event, “The Impending Impact of Climate Change”— impending meaning close at hand here and now, not off in the distant future. That was the clear take away from the National Climate Assessment that came out this week. Extreme temperatures, wildfires, floods are all increasing, not just in the future, though they will and they’ll be worse, most likely, but here and now. Seas are rising, warming, becoming more acidic. Glaciers and snow cover melting, on and on, and these have impacts here at home and, obviously, around the world for disease and heat stress, other health risks, declining crop yields, ecosystem damage, infrastructure losses, refugee and migration issues. So those are the topics that we’re going to talk about tonight with our three panelists. As I said, we have an excellent group to discuss how climate change is playing out both at home in cities like Houston and around the world in developing countries and elsewhere. To do that, we’re going to have a conversation with three people who are known to many of you. Somini Sengupta, a beautiful writer for The New York Times, the international climate reporter there who brings a wealth of experience in places like South Asia and West Africa to the discussion about how climate change is playing out around the world, so that’s particularly on topic for the event this evening. Kanta Kumari Rigaud is lead environmental specialist at the World Bank, has been deeply involved in the bank’s work on climate resilience around the world and on the topic of climate migration, particularly internal climate migration, so we’ll talk about that—in Washington, D.C.
And then Marvin Odum, who I’ve known for many years, is now in charge of Houston’s recovery after Hurricane Harvey and also brings a unique perspective to this topic discussion—climate change adaptation and resilience and climate change mitigation, which I’m sure we’ll talk about—from his prior role as president of the Shell Oil Company. So, Somini, let me start with you. You spent much of your life reporting from places that are already become casualties of climate change—we’re seeing that play out—you wrote about in your report just in the last day or two laying some of that out because it includes the city of your birth, Kolkata. Tell us just some stories. Tell us what you’re seeing on the ground. Tell us how this is playing out in the kind of work you do today and have done for a long time at The New York Times and which communities are most vulnerable to climate change—what are the sorts of impacts you’re seeing. SENGUPTA: Yeah. Thanks for that. So I wanted to understand what is the impending danger and so I went back to the beginning. I went back to the city that I was born in, Kolkata—one of the world’s, you know, imperial capitals. It was known as the second city of the British Empire, and like many world cities it was built in the delta—near the delta where the Ganges emptied out into the Bay of Bengal. And it’s precisely its location where it was built that makes it now so vulnerable—also how it was built that makes it so vulnerable. So it is a low-lying city. The water, when it comes, just stays there. The mangroves that used to border Kolkata have steadily begun to disappear. You know, they’ve been built on, and so the water has fewer places to go. The ocean is not so far away. It’s about a hundred kilometers away from Kolkata. So it’s very much affected by sea rise. And so when I went and looked at the city of my birth through this new set of glasses I’m wearing now, I saw a city that resembles a future that many of our cities will face. And what I was really most struck by was not just that the whole city is at risk—at considerable risk, but, of course the most vulnerable are the ones who are most vulnerable to everything. It was the poorest, and many of the poorest who, by the way, in a city like Kolkata, live on the sidewalks—they live outdoors or they live in shantytowns with very poor infrastructure. They were doing things like, you know, when the river rose or when the canals rose and their lanes got flooded, they raised their beds on some stools—sorry, on some bricks, and they put all their belongings on their beds. To me, it was, you know, that’s what adaptation—the word adaptation sort of signifies, right—like, moving up your bed on some bricks. But their entire neighborhoods were being washed away, right. Raising your bed on some bricks was really going to be pretty insufficient. So in some ways, the word adaptation fails to capture the kind of huge dramatic creative transformation of our economy, of our way of life, of the way we build cities, the kind of transformation that this moment demands. BORDOFF: Do you see that happening well in certain developing parts of the world where they’re kind of setting a good—a model for what needs to be done? SENGUPTA: You know, there are some things that are happening. There are lots of experiments underway. For example, the early warning systems in South and Southeast Asia for storms and cyclones—tropical cyclones—have really improved. So fewer lives are lost now during a cyclone in Bangladesh, for example. There are experiments underway to grow certain kinds of rice that are a little bit more tolerant to salinity. So, you know, there are experiments underway. What I also saw in Kolkata was the great movement of people already from even more vulnerable areas. So the people who lived in villages that were just in the delta in a place called the Sundarbans, you know, they’ve been hit again and again and again, and I was hearing from families who said, my house has washed away—my farmland has washed away—there’s really nothing for me to go back to—so, you know, I got on a train with hundreds of other people from my village and I came to Kolkata, and these are some of the most—some of the poorest people already in a very poor country who now live in, again, very, very vulnerable neighborhoods in the city. So that struck me. BORDOFF: And so that’s a good, I think, segue, Kanta, to bring you into the conversation because one form of adaptation is elevating bricks—elevating your bed. The other is just going somewhere else, and you’ve spent a lot of time studying issues of global migration and refugees. There’s a whole debate about how we classify the term refugees and what’s covered and what’s not. Talk a little bit about the problem of migration and refugees around the world and to what extent climate change is contributing to exacerbate that. RIGAUD: Yes, thank you. Thank you, Jason. I think this is a really important conversation. So glad to be here. That’s, I think, what so many set out is really a microcosm of what is happening in different places around the world, and what we did at the World Bank recently in March we launched a report called Groundswell: Preparing for Internal Climate Migration. The idea of this report was really to take the larger picture—the bigger picture—beyond these individual cases, beyond anecdotes, to really understand how climate’s impacts are going to unfold and what does that mean in terms of the scale and magnitude of climate-induced migration. We looked particularly at the slow onset climate impacts so we looked at stresses—water stresses, losses in crop productivity, and sea level rise coupled with storm surges—and what we found was just for the three regions that we focused—you know, South Asia, sub-Saharan Africa, and Latin America—we found that there could be as many as a hundred and forty-three million people who could be forced to move as a consequence of distress due to climate change. So this is quite, you know, a large figure, I think, if you look at it. But at the same time, what we’re saying is this is under the worst-case scenario, but by 2050, you would get that. Now, with good concrete climate mitigation and adaptation coupled with good development, you could reduce those numbers significantly and as much as 80 percent. But let me come back to Bangladesh, which I think is a really important case study, as so many say, but I think a country that has also taken this issue of climate resilience and climate adaptation quite seriously. Beyond, I think, the kind of adaption that so many mentioned in terms of what individuals are doing and, of course, even in terms of early warning systems, what I think when we did the consultations and the report in Bangladesh was that there is also this long-term perspective plan that the country has—the government has. It’s called the Bangladesh Perspective Plan that goes up to 2041, and they’ve recognized migration as an important part of that conversation to address it. And, clearly, I think what our report underscored was that, you know, while there is a certain amount of displacement that is happening now driven by extreme events and even sometimes slow onset events, that is going to ramp up in the time to come in the next few decades, and unless we take some concrete action now and begin to have policies that anticipated and really bring about some of this transformations in the planning and the way in which development is conceived, we would continue to be behind that curve. So I think that’s just a point that I think it’s really important too as part of the conversation that we want to have. BORDOFF: Yeah, that’s really helpful, and the example of Bangladesh is really helpful. Can you just say another word—give a little bit more of a concrete sense of the sorts of actions that the World Bank is taking with countries to build resilience? What are the top one, two, three adaptation tools that you see working most effectively that we need to do more of, going forward, and then I also want you to talk about who’s going to pay for it. RIGAUD: Yes. What I think is we need to frame this sort of displacement migration conversation in the larger development context and I think that’s where, in the context of the World Bank, it’s a really important one. So what we find is that, you know, there are projects and interventions that we do which address in response to an emergency or a crisis situation. So when you have displacements due to a disaster or displacement due to crisis or conflicts, there is a certain amount of interventions that the bank brings in. So, for example, I mean, when there is an extreme event like a drought, take, for example, in northern Uganda. There is a social action fund project that I think was a really important one where, clearly, you know, when the El Niño hit a couple of years ago there was a lot of drought. But in this particular area, they were able to combine focus-based financing to really trigger in a system whereby the communities were given cash for work, and they were given cash for work early enough that they didn’t reach a distressed situation and the number of people who were impacted by the drought was considerably reduced. So I think there is interventions like this which are happening for extreme events. But at the same time, I think what is really shifting, I think, across the world and the bank as well is to work closely with the governments through their national development plans and through their own commitments in the nationally determined contributions as part of the Paris Agreement to make those transformations in planning, to bring climate considerations into the development planning stage, into the budgetary processes of the governments, so that you are actually bringing it into the conversations at the program level of the project. Now, this is a slow process. It’s not happening everywhere. But I think we are sowing the seeds, working with the other partners, and that is really important because I think to the point that Somini makes, you can only lift your bricks that high and then the bricks are getting washed away. So you really have to have a different way in which you conceive some of the livelihood options to make sure that you have durable solutions. BORDOFF: That’s great. Thank you. We’ll come back to this issue of sort of who’s going to pay for it. I feel that’s important. Marvin, we saw a lot of bricks washed away in Hurricane Harvey—pretty disastrous for the city of Houston. So this is hitting right at home and, obviously, New York during Sandy. There are many examples, so it’s not just the poorest countries in the world. Can you just talk a little bit about the impact of Harvey on Houston, the efforts being undertaken now not only to rebuild but also to make it more resilient? So as you know, there was a lot of discussion in the post-mortem about how failures of policy, of zoning, of flood plain maps, contributed to how severe the damage was. You know, what steps are being taken to increase resilience, moving forward? ODUM: Well, thank you, Jason. I think the—you know, it’s interesting. As we’ve talked about Kolkata and then Bangladesh, and you can think about Houston as another analog that I think is important—it’s not really provincial, which is the way I sort of came into the conversation thinking. It actually is a terrific analog for the rest of the world. If I was to designate the change in Houston post-Harvey in a single phrase, it would be the dramatic shift in political will and public will around doing something about the situation. So if you live in Houston your sentiment right now is, I’ve lived through three five-hundred- or thousand-year storms in the last four years and we’ve flooded three times. We’ve had five federally-declared disasters in the last four years. So it’s a very different sentiment. So now the conversation around climate change and that type of thing can still be a sticky one depending on the audience and where you are. But the pragmatic discussion around adaptation is not really that difficult to the conversation anymore. And so we came into it with that shift, I think, in the overall framework, which allowed us to commit with the city and with the partners around the various jurisdictions around Houston and build a program that worked a number of parallel paths, and those range from sort of the obvious—get people back on their feet and that whole element of recovery, which we won’t focus on so much right now—but then it’s around, basically, looking and rethinking the entire city. So it’s a city that’s famous for having pretty rampant and sort of free-form development and what’s—you know, what has that resulted in in terms of its flooding and that type of thing. So we have rethought development. We’ve redefined what the building codes are and the requirements in terms of expanding in the city in a way that preserves the economic prosperity, if you will. That was everybody’s big concern about changing it is we’re going to start to pull back on the economic growth in the city. You can actually do this while preserving the economic growth in the city. And so make those changes, have new requirements, and you can’t now build anything—I feel pretty confident in saying you can’t now build something in Houston that if we had another Harvey after it was built it’s going to be flooded, and that’s pretty important. Now, that’s a bold statement and I could be challenged pretty heavily on that statement. But what I’m telling you is we now have some of the most restrictive building codes in terms of protection from flooding in the entire country, and that’s important. That was not easy to make that change. So even though I described on the front end that there’s a change in political and public will, that would have been impossible two years ago, and when it came to a vote at—we used the city council as a proxy—it was a 9-7 vote to make those changes. So it’s—you know, we’re still kind of in that space where it’s a challenge. The other major strains, just to make this story a little quicker, are around the significant elements of mitigation. So as we’re going in and now repairing billions of dollars’ worth of city infrastructure, the mantra that we have is we’re going to build forward, not build back, and basically what that means to everybody that’s involved is you don’t just build something the way it was before. You build it with a Harvey plus a safety factor in mind and you say, what do we have to do to mitigate this from happening again. In some cases, the only option is to move something to a different location. Tear it down and move it—to buy out homes in a floodway and help those people move to a different location. It’s the same thing with buildings. In some cases, you can harden with, you know, better protection, raising critical equipment to higher and that type of thing. So we’re making sure that that mitigation comes in with those standards sort of post-disaster repairs. And then the final category, which is ultimately the biggest in terms of long-term impact, is what I call flood mitigation. But, basically, it’s putting in the infrastructure that it requires to start to fix this on a very broad scale, a very long-term basis. And what that means—maybe these numbers will help put it in terms of scale—I’m talking about $35 billion worth of projects over about a thirty-year time frame; not just protecting from flooding in the city and the changes you have to make there but also the real disaster case scenario for a coastal city like Houston, which is a hurricane that comes up the ship channel and if that was to happen and there’s a certain probability of that happening it would do much more damage than anything like we saw in Harvey. So long-term flood mitigation that structurally changes the way the water moves through the city and the heavy use of green infrastructure in that approach but then also hardening along the coast from that surge threat. BORDOFF: —like in our political system as a whole and our country as a whole, large segments that are reluctant to acknowledge what I think is the urgency of the challenge. Is that changing as we see these impacts play out? ODUM: Well, I think it’s definitely changing. Of course, you feel it changing, I think, across the world and it’s changing in Texas and in Houston in a similar fashion. But the thing I’ve found myself saying a lot over the last year is, listen, I can talk about everything I just covered and the importance of spending that money and the urgency to do that, whether in a climate change discussion or if you don’t want to talk about climate change we can just have it based on the fact that we see this ratcheting up of, you know, sort of deviating events from the norm of what we expect from the climate and from weather and it just points to exactly the same thing. So we found a way to get there in either direction from an adaptation point of view so to spend the money and to put the urgency around adaptation. That’s not necessarily the same as saying you’d have that common sentiment around if you say—if you use the word mitigation, meaning how do you get ahead of the climate issue, less carbon into the air, into the atmosphere and that type of thing. Less of a consensus, certainly, around that. But it’s a state of many contradictions. I think Houston—I’m not 100 percent confident in this but I think there’s some parameters around which it’s correct. Maybe it’s a large urban area. It has more—it uses more renewable power than any other large city in the nation. I think that’s a fairly safe conversation. BORDOFF: Yeah. Well, Texas has been a leader in wind along with oil and gas for a while. Somini, let me come back to you. India—strong need to adapt and build resilience, as we’ve been talking about. Part of adaptation may be increased cooling, water filtration, lots of things that use energy. The country as a whole is using a lot more energy, as you wrote about in The New York Times on Sunday how hard it is to move away from coal. So can you talk about how you see the sort of dual challenges playing out of the increased demand for energy and at the same time, you know, to what extent is pressure—whether it’s about local air pollution, which is an enormous public health problem there and gets a lot of public attention, but also to build resilience. How much impact is that having to encourage a different path when it comes to developing energy resources and consumption? SENGUPTA: Can I just get back quickly to the science? There’s a lot of debate over issues of climate science. But it’s pretty incontrovertible that if you pump more greenhouse gases into the atmosphere it’s going to get hotter. Like, there’s no debate about that. Science is very clear. So the IPCC report—even before the National Climate Assessment came out the IPCC report, which is, you know, a U.N. panel made up of scientists from all over the world including the United States, the latest one painted a very, very dire picture of what happens not only if we warm 2 degrees Celsius or higher than pre-industrial levels but what happens at the 1.5 degree. What if we go 1.5 degrees Celsius above pre-industrial levels? It’s pretty bad. Consequences are pretty severe by 2040. In 2040, my daughter will be thirty-two, I think. You know, that’s coming up. We’re talking about massive coastal flooding, much more frequent wildfires in places that are unaccustomed to dealing with wildfires, so not just California but parts of the U.S. southeast. Places close to the Arctic Circle this summer suffered wildfires, which is, you know, a little mind boggling. So the scientists are fairly clear—not just clear, but have been ringing the alarm about the need for very, very urgent action. There’s three things that the IPCC report was pretty clear on. One was a price on carbon. One was getting out of coal. Coal is now the largest—accounts for the largest share of electricity generation worldwide, about 40 percent. By 2050, according to the IPCC report, the world should be getting close to zero. That requires a super-fast transformation, which, technically, is possible. SENGUPTA: Politically, much harder, because as I wrote in the story that you were referring to, coal is a very powerful incumbent. The age we live in—the Industrial Age—was built on coal. It is also the most polluting kind of fossil fuel. So the three things that scientists, you know, are talking about—price on carbon, getting out of coal—what was the third? I’ll think of it. It’ll come to me. Renewables—sorry. Connected to that. Connected to getting out of coal, shifting very, very fast to renewables, right. You asked the question, can a country—a developing country with a huge energy appetite like India or Vietnam—I was recently in Vietnam. Energy demand is growing very, very fast. Almost—a lot of it now comes from coal-fired power plants. Some of it comes from hydro and, you know, there is absolutely a difficulty in those countries ginning up renewables fast enough. But it’s not just that renewables can’t be ginned up fast enough. It’s that the electricity grid in those countries has to be reimagined. The electricity grid was built for coal. So, again, it requires a pretty creative fast transformation of pretty basic infrastructure. The question is not whether it’s technically possible. The question is whether it’s politically possible and whether the interests that make money from those fossil fuels, you know, and political interests that are supported by them will enable us—will allow us to get there. BORDOFF: Yeah. It’s a staggering challenge when you think about what—how steep the decline would need to start to be, because we haven’t started yet to get anywhere close to 1½ or 2 degrees. BORDOFF: And that is why adaptation and resilience is, unfortunately, going to be probably more important. Other technologies, too. There was a huge conference with the International Energy Agency, the U.K. government, and others in Scotland this week on carbon capture and direct air capture—technologies that will pull CO2 out of the air—because people recognize that we just aren’t on track or anywhere close to it. SENGUPTA: Sorry. That was the third thing that I was thinking of. SENGUPTA: Sucking carbon out of the atmosphere. Sucking carbon out of the atmosphere—you know, scientifically how to—you know, how to do that. You know, that’s an engineering challenge. BORDOFF: A lot of my colleagues at Columbia are working on that. BORDOFF: Yeah. But adaptation and resilience will need to happen to some degree. We want to limit the extent to which that degree is. So just, quickly, before we go to the audience, Kanta, can you—or anyone, really—come in on this question of the scale of funding that is needed—the scale of the resources that’s needed to help some of the poorest countries in the world become more resilient to these impacts and how do we pay for it? RIGAUD: Yeah, I’m happy to go on that. Just this morning I believe there was a communiqué put out—I’m not quite sure by whom—but it was covering the Africa, Pacific, and Caribbean countries and it said that the scale of funding needed for both adaptation and mitigation in these countries would be on the order of $2.7 trillion, OK, so that sort of numbers out there, and under the Paris Agreement it’s 100 billion (dollars). And I think there is a clear gap, I mean, between what the needs are and what is on the table. I mean, so if we think about the Green Climate Fund today—that’s sort of the instrument—it has about $10.3 billion, you know, pledged and available. And then there is even a gap between what is flowing to some of the countries that need it the most. When you talk about in sub-Saharan Africa, I think that there have been estimates that say that what goes to the region is about $3 billion a year. Put that in perspective in terms of what the needs are just in terms of infrastructure development, and we’re not talking about the climate part of it. I think what Marvin was talking about, standards and reimagining some of this flood mitigation to be sort of more robust a climate. Just from an infrastructure perspective, it’s $93 billion a year. So when we talk about money, I think the scale is really very different from what’s available. But the other constraint we have is the capacity—the absorptive capacity—and I think that’s a really important area to focus as well because otherwise we’re just not going to get the house in order between what we need and how we need it and who’s going to do it. ODUM: There’s just some other numbers, quickly, that I found helpful as we were thinking through some of this over the last year. If you just add up the sort of response cost of the three hurricanes that we had in ‘17—so Irma, Maria, and Harvey—it’s on the order of $265 billion in damage. So, again, so you put your arms around an area and use it as an analog. So Houston, Texas, looking at numbers like that, you can get your mind pretty quickly around it makes a lot of sense to spend this money on mitigation, and I think even the—you know, and most areas of the federal government now as well as other related governments are, you know, clued into this fact that the value of mitigation dollars spent is on the order of six to one return, maybe even higher than that in some cases. So I think the case is actually very, very clear. BORDOFF: Yeah. There was an article that just posted on The New York Times by Lisa Friedman this afternoon about the need for the energy sector itself to become more resilient and the National Climate Assessment talked about the extent to which our energy infrastructure, from the electricity system to pipelines and refineries in Houston and everything else, is hardening as well in anticipation of this. BORDOFF: Yeah. Well, not start there but continue there. BORDOFF: The meeting’s coming up. BORDOFF: OK. We are going to go to questions from the audience. If folks could please keep it brief. We have a lot of people here and also we want to take some questions. Marvin is going to moderate and call on some people in Washington, D.C. There’s a first hand that went up over there—gentleman in the suit, please, and then up in the front. Q: Gentleman in the suit is pretty tough to—(laughter). It’s great to hear from you guys. My name is Jay Koh and I’m one of the managing partners of the Lightsmith Group. And we’re actually focused for the first time on investing private equity and growth equity in the resilience and adaptation question itself. And so here’s my question for everybody on the panel, which is this. Mitigation has received 94 percent of climate finance for the last several years in a row. So to Jason’s question of, like, hey, you know, don’t we play defense as well as offense here, so sure, we should reduce carbon footprint, but in the meantime people are dying in, you know, South Asia. Two thousand five hundred people died last year. We have no more typhoon season in Japan. It’s just typhoons all the time now. You have the wildfires taking 22 percent off the market cap of PG&E in the last, you know, quarter here. And so the question is the private sector has to be involved here and capital has to be put into this, and it’s less than 6 percent of public and private capital flows right now. So how do we actually get adaptation to be financed? How do we actually get capital flow there. Particularly when looking at the World Bank and the IFC, they’ve done zero climate funds in the private sector in the last three years and less than 3 percent in the MBB report that just was released in 2017 of any funding at all regarding adaptation had anything to do with private sector at all. So this is not just the government and zoning. This is also how do you get entrepreneurship and real capital at a problem that the UNEP thinks is a $300 billion a year problem by 2030 for developing countries alone. And so why is this, when we’re seeing the effects of it right now, a 6 percent question for the public sector and the private sector? Thanks. BORDOFF: That’s a great question. I’ll call on someone unless one of you wants to jump in. ODUM: Jason, maybe just a couple of comments. I mean, I think one of the things you have to—for the scale that we’re talking about, and I take all those comments to heart, you have to be able to utilize not just the private sector but also some market force that really drives you in that direction. So I think it brings us right back to a price on carbon, price on greenhouse gas emissions, and that being a fundamental element to be able to address the type of thing that we need at scale. So I’ll just lay that out there as a fundamental marker. I think we’ve—you know, again, back to this sort of provincial view, we’ve been trying to close this gap for the last couple of months on how do you take sort of the interest the private sector has in applying this mitigation and somehow value that and bring them into that equation of paying for it and, you know, whether—so there are mechanisms out there. We’re talking to a number of experts and we’ve got a couple of colleagues here in the room that could probably add more to that. But we’re going to figure out a way to close that gap and I think of it just like insurance. So I think of, you know, the ship channel in Houston. Maybe a half a trillion dollars in enterprise value in petrochemical industry sits right there and they recognize this threat. I guarantee—I can tell you first hand that we understand the threat from hurricanes, from flooding, and so forth. And it’s not just damage to facilities. It’s also, you know, the potential environmental disasters you have when something is disrupted in a very significant way. And so there’s a lot of money being spent on hardening around those assets in particular. But if there’s something that could be done on a broader scale that required money now that would basically have the effect of lowering my premiums on the insurance that I at least notionally have to carry to cover those assets and there’s a financial equation there somewhere that works, we just haven’t quite brought it to ground yet. But we need to figure that one out. BORDOFF: Kanta, can you just—the question of what the right ratio is when we think about public funding—the adaptation to mitigation—how do you think about the answer to that? RIGAUD: You know, I think there’s a lot of call for this to be parity—like, you know, 50 percent to adaptation and 50 percent to mitigation. Clearly, I think we need to step up the resources that are available for adaptation because I think to the point that the—the question was that, you know, there are people who are—whose livelihoods are literally being disrupted or they’re sort of being so directly affected. But I also want to caution against a very simplistic way of keeping this parity. So as I mentioned just now, think about in sub-Saharan Africa where two out of three people do not have access to electricity, which means that they don’t get good education. They don’t have access to sometimes good health clinics. They don’t have access to businesses and livelihoods that, therefore, you know, are sort of strong and robust. So and, you know, having electricity is going to change—you know, and hopefully, renewable—is going to change the way in which these people live and the kind of quality of life and that development part is really important. So if we turn around and think that we want to put less into mitigation in the context of, say, sub-Saharan Africa, I think it would also be a disservice if we don’t think about it holistically to deliver that. So I, clearly, agree that we need more in adaptation but I don’t want it to swing so far that it undermines the very pathway of robust and development that we’re trying to seek in the broader context. BORDOFF: We have a lot of of—oh, sorry. Go ahead. SENGUPTA: This question of how much money for adaptation and mitigation—as I said, this is going to be really at the heart of the climate negotiations in December because there’s a rich country/poor country divide on this issue. Poor countries are clamoring for more adaptation funding and this is going to be one of the central fights. BORDOFF: I think the question is important, too, because it’s a reminder it’s not just public funding but the question is how to pull the private capital in that we need. There’s a lot of questions and some are in Washington. So, Marvin, are there people who have questions there? ODUM: Yes. So we’ll go to a question in this room. Yes, sir. Q: Thomas Graham, Lightbridge Corporation. I think this has been a very interesting discussion. But I would just like to add a little something else to it. In 2016 and, again, this year, the leading banks of New York—Goldman Sachs, JPMorgan, Citibank, Bank of America, one other—said for the first fifteen years of successful adaptation and dealing with climate change, it’s going to cost $90 trillion. Is there any hope of doing that? I mean, I don’t see it. I mean, that’s an immense sum, and can you offer any help that that’s within the realm of something that could be done? ODUM: Well, maybe I’ll start on this one. I can’t answer the—you know, directly to the study that was done there on the 90 trillion (dollars), just on the front end. But what I can tell you is when I was at Shell, and it’s still out there—you can go find this—we developed scenarios for various cases, and the case where we said we need a scenario where actually the world gets to, you know, the 2-degree-C line, at least to that. It’s called the sky scenario, and basically it lays out a pathway that, you know, through coal going away relatively quickly, through less oil over time through massive increases in electrification through policy elements like a price on carbon, and you can imagine what all I would say. You know, there’s all those details there. It does an economic assessment of that to say is this feasible or not. It’s very difficult but it’s feasible, I would say. And then you get to, unlike the—I think somebody may have said it early on—this goal of a, you know, zero net emissions by 2050, it’s really more like 2070 as we could kind of make it all work out. But still, you can do a pretty good job of getting to the end point you need to get to. Tremendously difficult. A lot of things have to start relatively soon. But that’s the degree to the kind of challenge that I felt like you laid out there, which is just so impossibly hard and so expensive. I’d say, no, actually there are some pathways that do some definition of what steps we need to take now and the trick is just starting to take them. BORDOFF: Yeah, and the other thing—go ahead, Kanta. RIGAUD: Yeah. No, I was going to say probably about the same point. I mean, I think that those numbers are staggering and can be very disheartening and think you’re going to give up. But I think one sort of key take away from the IPCC 1.5 degrees special report is that really keeping things to below 2 or keeping them, if ever possible, below 1.5 really makes things very different. I mean, you know, the higher we go and we trigger those tipping points we’re in a whole different new climate normal where I think those kinds of demands are going to be upon us. So I think the biggest, you know, challenge for us is how do we keep to within the 1.5. Even at the 1.5 that we could be locked into there’s a lot to do on adaptation. But it is probably much more manageable than we are in this sort of new climate normal cap place. So just adding to that. Mitigate, mitigate, mitigate, I guess, is what we’re saying. BORDOFF: Let’s take another question. ODUM: Jason, you were going to—yeah. BORDOFF: I was going to go to a question in New York. But the gentleman here in the front. Q: Thanks. Bob Scott, Adelphi University. In addition to the physical and the financial infrastructure there’s a policy infrastructure. Following Hurricane Sandy, I had at Adelphi faculty, staff, and student families who were wiped out of their homes and we tried to help. And the policy infrastructure is simply not coordinated. I have stories about people trying to deal with zoning, contractors, insurance companies, and FEMA, and none of them talk to each other, and there was a big problem between insurance companies and FEMA. What can we learn from other countries or from the experience in Houston to help bring some coordination to this part of the policy infrastructure? BORDOFF: That’s a good question. I certainly saw some of the difficulty communicating during Hurricane Sandy. I was in the White House at the time. But, Marvin, can you talk a little bit about what—how you’ve seen this policy response play out and where it’s working and where it’s not? ODUM: I can, if you really want to go there the way the question was posed, because I see a significant potential for improvement. I’ll just say it very kindly that way. (Laughter.) I think the—well, there are two things I would really zero in on. One is we have to recognize there’s some sort of perverse incentives built into disaster recovery and disaster response in this country that shouldn’t be that hard to fix. So think about something as simple as the National Flood Insurance Program that, basically, if your house gets flooded we’ll pay to have it fixed and then if it gets flooded two years later we’ll pay to have it fixed, and you just kind of go through that cycle again. So that’s, clearly, something that could be done in a better way. I think the way I would describe—listen, what I’m getting ready to describe to you is a systems problem and I say it’s not a people problem. The people that are—you know, whether they’re in FEMA or wherever, trying to make this work well, are great people dealing with very difficult systems. But I think what we have is now almost forty years of disaster recovery where we’ve had an experience. We’ve layered on a new regulation and so forth and so forth. You do that for forty years and you get a system that’s basically unworkable and in a city like Houston where we had the storm, you know, fifteen months ago, the first money from—very massive amounts of money—but the first money from the federal government to help people with housing is, hopefully, going to be there in December of this year. So, you know, with a just simple process redesign—I like the way the question was posed—what can we learn from other places as we start that—you could go in and knock out, I think, 60, 70 percent of that time and get rid of those perverse incentives. So that’s one thing that I think we should take on at least as a national initiative. BORDOFF: Why don’t you pick someone in Washington for a question? Q: Thank you. Sherri Goodman. Great panel and great discussion. So following on that last comment, you know, we know that we have—we have an imbalance in the investments that we make in disaster risk reduction compared to immediate recovery and that goes not only to climate change but that goes to general—and that occurs not only in the U.S. but, generally, across multilateral institutions as well. And that, in some ways, is the essence of how we turn the adaptation wheel around because if we’re always trying to build back the same way then we’re never going to be able to build back a different way and fully adapt our societies. So how do we sort of—you know, a crisis is—we should never waste a crisis, you know, the old adage says. And in the Cold War, you know, we were able to recognize that a bolt out of the blue nuclear attack was a, you know, low probability but very high consequence event and defend against that with massive investment of American GDP and globally as well. We still are very challenged to make that same level of global investment for what is really a high consequence and high probability, as characterized by the title of this talk, impending, recognizing the NCA4 assessment. How do we fully sort of make this shift, whether it’s—not talking about climate in Houston but the adaptation or whether in the global realms in which the rest of you deal we actually fully make this shift? BORDOFF: Who wants to take that one? If I can call on someone. I mean, we were talking about your experience in developing parts of the world. But you’ve also had a lot of experience looking at multilateral organizations like the U.N. in particular through your reporting. So do you have any thoughts on how we mobilize these institutions a bit more effectively to the urgency? SENGUPTA: You know, I’m going to channel Madeleine L’Engle A Wrinkle in Time—the author of A Wrinkle in Time—who said something along the lines of, you know, terrible things happen and we learn from them. So terrible things are happening, as the scientific reports that I’ve been reading are showing. The question is, you know, are we learning from them and are we learning from them fast enough. I’m a reporter, so I will refrain from saying what multilateral institutions should or shouldn’t be doing. (Laughter.) I can tell you that the multilateral negotiations that are the mechanism for dealing with this massive global challenge are in some trouble. The Paris Accord three years ago was a high point in global diplomacy. But the problem wasn’t solved there. The Paris Accord was constructed in such a way that every country got to say, we’re going to bring down our emissions like this by this date, right. But then it left a lot of things to be done and those are the most important things—how is this agreement going to be implemented—and that is on some shaky ground, not least because the U.S. announced its planned exit. Beyond that, the implementation of the Paris Accord is on some shaky ground and we’ll see how it plays out in the coming weeks and the coming year. BORDOFF: Yeah. Your journalist caution to opine reminded me that I—my instructions tell me to inform everyone this meeting is on the record. So you were right to be cautious. SENGUPTA: Except when they’re not. BORDOFF: Let’s go to the back of the room, if we could, because I’ve been focused on the front. Yeah, the woman in the back, please. Q: Thanks. Caitlin Hu, geopolitics editor at Quartz. Just to bring this back to the displacement part of the conversation, considering the cost of disaster mitigation and the fact that the climate has manifestly already changed, I’d love to hear from anyone on the panel about what multilateral institutions or governments or other actors should do in terms of facilitating displacement and pulling up stakes in, clearly, disaster-prone cities like Houston or Jakarta. SENGUPTA: I’ll just tell you a story that I did a couple years ago. I went to West Africa to Niger to the city of Agadez, which is, like, the gateway to the Sahara, where a whole stream of West African mostly men, a few women, all young, were making this incredible journey—incredibly difficult journey across West Africa to Libya and then some of them hoped to cross the Mediterranean from there. Were they—they were not considered climate migrants. There was no category for them. They were—most of them were not considered refugees because they were not, strictly speaking, fleeing war and persecution. They were considered and sort of dismissed as economic migrants. But they were leaving their home countries because climate change, along with other things, had made it impossible for them to make a living—to support themselves. They were, for all intents and purposes, forcibly displaced. And so this is the discussion that I think a lot of people in the migration refugee community, you know, have been having for the last couple of years. Do we still hold on to this post-war definition of a refugee that’s enshrined in the U.N. Refugee Convention? Do we tweak that? Do we open up the Refugee Convention at a moment like this when countries are not abiding by even those tenets of the Refugee Convention? So, you know, but I think a lot of smart people are thinking about how to think about what do you do with people who are forcibly displaced when you can no longer live in that place because it’s washed away or you can’t make a living and you have to move. The vast majority of those people, I have found, are moving from one place in their own country to another place in their own country, right. They’re internal migrants, as Kanta knows well. But some of them may be crossing borders. So it really—again, it demands a kind of creative and dramatic transformation in the way we think about the world. BORDOFF: There’s a lot of hands. So I want to go to as many questions in our remaining minutes as possible. Let’s go to Washington. Marvin. ODUM: OK. Yes, sir. Yeah. No. Yeah, you’ve been waiting from the very beginning. Great discussion. The ultimate adaptation—geoengineering—we haven’t really discussed yet and that would be, you know, human-engineered intervention to arrest and then reverse global warming such as solar radiation management, you know, sulfates, aerosols in the stratosphere, or ocean iron seeding or accelerating the carbon geologic cycle with silicate, you know, enhanced weathering or synthetic biology by, you know, gene drives and gene editing, creating plants and animals that are climate resilient—all those sorts of things advancing technologically and scientifically without any governance in place—international governance, domestic governance, no multilateral kind of mechanisms and treaties to deal with that—sovereignty issues, security issues, probably the biggest issue, the moral hazard of it and those that believe that we can continue our way of life if there is a quick fix solution such as geoengineering. So views on that ultimate adaptation tools or those sets of tools. BORDOFF: So that may need a whole meeting on its own. That’s a big topic. But does anyone want to, quickly, comment on it? ODUM: Maybe just a comment, because I’ve recently joined a group and this would be, you know, MIT, Ernie Moniz, and others looking at, basically, you know, carbon dioxide reductions, so a subset of what you’re talking about there. My personal view is, and this is a very strong personal view, which is why I wanted to speak on it, is it takes all of these things that we’ve been talking about tonight, right. It takes the shifts from the private sector in energy usage and otherwise. It takes a price on carbon. It takes, again, everything. But I’m sure not going to sit here and say I don’t want somebody working on carbon dioxide removal as a backup plan whether, you know, concern about moral hazard or whatever. I want to be sure somebody’s working on that as well. So I won’t try to address your idea of who’s governing that but I think that structure that I’m talking about in particular are very reputable institutions and people with links back into the government that can help drive that in the right direction. I feel a lot of confidence in that effort and that’s why I chose to be part of it. BORDOFF: There’s a whole area of carbon management which includes direct air capture—a whole area that is, I think, different around geoengineering and different technologies there and a lot of institutions looking at many of these things. I would just say there’s almost no scenario of anywhere close to 1½ or even 2 degrees that doesn’t have built-in pretty large negative emissions at this point and that’s just the reality of where we are. Yes, in the front here. You had your—you were waiting patiently. Q: Hi. Terry Hastings, New York State Homeland Security and Emergency Services. First, thank you for a great discussion. I really appreciate that. So we’re, obviously, very interested in practical solutions. These are very complex problems, obviously. We don’t have trillions or billions of dollars at the state level to address it. But what are—what is the single biggest or most important thing that can be done at the state level to begin to address this issue in a meaningful way? BORDOFF: Maybe we’ll kind of end on that question by answering it at the state level and then maybe also at the international level in some of the developing countries or the places, continents that many of you have looked at most closely. If you had to—what’s the most important thing that we should be focused on from a policy standpoint or from a private sector standpoint? Marvin, do you want to start at the kind of state or city level? ODUM: Yeah, I think—yeah. I mean, the state question is really close to me right now because we’ve been working in that world for a while and I think it’s recognizing that, you know, while—yeah, I’ll stick with the premise of very practical but also still big solutions. So I described this flood mitigation program that needs to go in over the next thirty years but can be very well mapped out and it can be thought through in terms of who pays for it and that type of thing. That’s much bigger than a city of Houston. It’s much bigger than a, you know, Gulf Coast region around the metropolitan area. It really does require the state to step in and not only help with that definition, help with that linkage back to the federal government, but also to help with the funding element to recognize. And, really, to the previous question a little bit, there is no contemplation of let’s just move everybody out of Houston because it’s close to the coast and it’s vulnerable. Right or wrong, that’s not part of the discussion, right. It’s all about how do we mitigate and adapt to what could be a bad scenario but we feel like we can—we make a better fix-it. But inside there’s all sorts of analogs about returning a large swath of area back to nature where floodways and water needs to naturally move and that does mean displacing people and moving them to other areas and there’s all sorts of policy elements at the federal level and at the state level that can make that much easier than it is today. So I’ll just leave you with that thought. BORDOFF: —or national policies around the world, what would you—what would you say? RIGAUD: Well, I think what’s really important, at least in the countries that we work in, is to really understand what climate change means. So now we can talk about the global trends and patterns. But when it translates down to what does it mean for the economy of a country that’s changing because the rains don’t come on time or droughts come, not just for the current set of events but really understanding this issue over both temporal and spatial scales, because without that understanding you’re not going to be able to bring it into the longer-term solutions. So let me give you an example. Ethiopia is a country that has a hundred million people today. By 2050, it could have anywhere around a hundred and seventy to a hundred and eighty million people. Seventy percent of those people are engaged in agriculture and they’re going to have a massive youth bulge with the assumption that somehow they’re going to get absorbed into those systems which are going to be challenged by climate change. So unless a country begins to look at the climate impact in relation to these demographics and the economic transition they need to make out of climate-sensitive sectors, it’s going to be a hard thing, going into the future. So really understanding it, and I think there’s always a need to address the current crisis. But unless we help these transformations to happen over the medium to longer term, I think it’ll be—we’ll be in a tough place. So understand, plan, prepare, and act. I mean, it’s easy to say. A lot to do. There’s, you know, capacity, financing, and all of it. But I think it’s really important to get those transformational parts ticking at this point. BORDOFF: Somini, you’ve got the final word. SENGUPTA: Yeah. I mean, one of the funnest parts of my job is learning what really creative, really smart people and groups are doing in states and cities around the world. And so it sort of spans the gamut. There are cities in Europe and in Latin America that are improving their public transportation system to just fundamentally or reorient their cities so they get rid of or reduce the number of diesel-guzzling buses or cars. Cape Town, when faced with a crippling multi-year drought and a severe water crisis, did some really interesting things to fundamentally change human behavior on water consumption—like, the hardest thing to do, changing our relationship to water. The mayor of Quito is building, like—what did he say—it was like a cable car system to help people who are living in some of the highlands, you know, to come into the center city and not get on these really polluting kind of mini buses. California passed Senate Bill 100, which the governor then signed. BORDOFF: This is a room that probably is subscribing already, but maybe a few outliers.